School signs are a staple for all schools in the community. 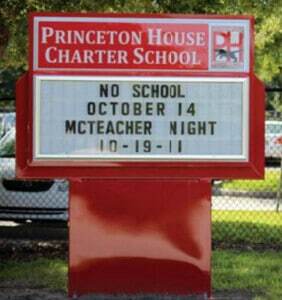 School signs help to identify the school and in most cases communicate upcoming events and messages to the community. Sign-Express specializes in school signs in combination with changeable letter signs and LED signs to achieve the optimal impact. Changeable letter signs also known as marquee signs are a very cost effective way for a school to put messages on their sign to announce events and messages. More an more, LED school signs are gaining in popularity due to their eye catching nature, ease of programming and moving message capability. School LED signs are available at Sign-Express is a variety of sizes and resolutions. The cost is surprisingly very affordable and Sign-Express offers flexible financing terms to any non-profit school when purchasing their new school sign. Marquee school signs and LED school signs provide the perfect media to communicate with your local community. Display events, report card notifications, meetings and more with a new school sign for your school. LED school signs are the best solution for schools through their awesome range of message abilities to the ease of programming for LED school signs. No more standing in the rain to change your messages or having your messages rearranged by vandals. 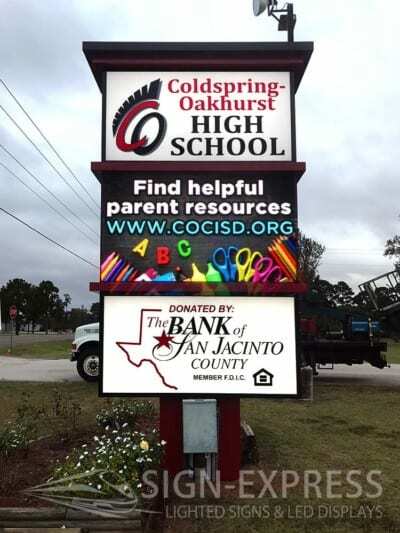 Sign-Express sells a wide variety of LED school signs that will fit whatever budget your school may need. 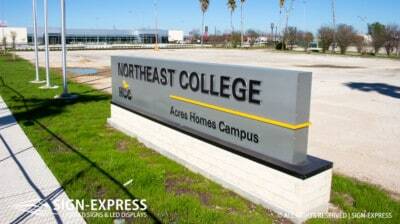 Let our professional designers create the perfect LED school sign for your school. ADA compliant signage is a requirement for all public and private schools alike. 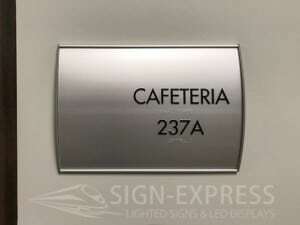 Sign-Express can help design and produce a variety of ADA school signs for your school. OUr facility is outfitted with a complete ADA sign manufacturing equipment line to product quality signage. Color mathcing paint system, ADA compliant braille insertion, larger outdoor wayfinding signage and more. Monument school signs are a beautiful addition to your campus. 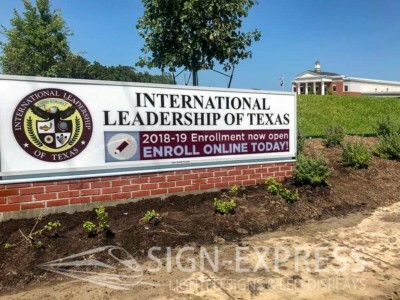 Sign-Express has school sign monument designers on staff that can match your building design or create a unique school sign design that will really draw attention. 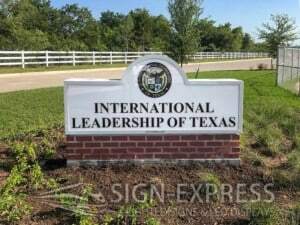 School monument signs can consist of masonry, stucco or painted aluminum. We offer custom vinyl, FREE logo creation, raised letter, reverse lit letters to create a glow effect and more. Changeable copy school signs and marquee school signs are a great way to talk to your community and members. 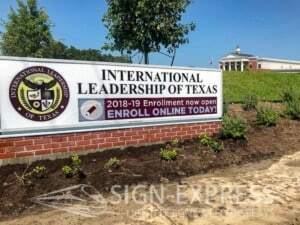 Our professional school sign designers will work with your school to create a changeable letter school sign that is just right. Thousands of logos and FREE logo creation services are available for all school sign purchases.